I hope that this site is helpful to guide you and your family in what we accomplish in PE and how we reach our learning targets. Thank you for stopping by! We started our Rolling and Riding Unit this week for grades 3-5. Next week we'll be rolling and riding on bikes from the Cascade Bicycle Club. Please plan to send your kiddo to school with weather appropriate clothing and shoes that support bike riding (ie: closed toes, snug on feet). We have plenty of helmets available for students to use, with lice blocking surgical caps to wear, though you're welcome to also send a helmet from home along if available. Please review the bike safety video in "documents and videos" as well as the appropriate helmet fitting document if possible. The days we plan to be outside riding during PE are 4/22-4/30. It's already March and time for some Basketball skills in PE! We'll celebrate most of the month with basketball activities and games. We'll also review the function of muscles and major muscle groups that help us to participate in physical activities like basketball. With any team sport unit in PE, we practice sportsmanship and emphasize our QAE belief: I am aware. I am safe. We are connected. Looking for a challenge to complete at home? Check out the March Fitness Challenge Calendar- it's full of March Madness basketball skills! 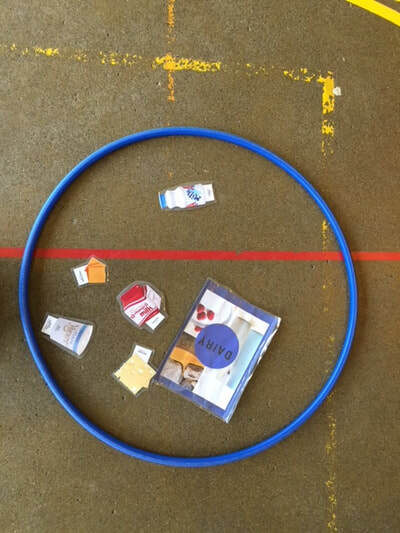 The last two weeks, 3rd-5th graders have been working on setting goals for our fitness assessments. Each student has found one assessment they'd like to improve in for our mid-year "goal" assessment. Next week, we'll begin the process of fitness assessments in PE. These include Pacer (Cardiorespiratory Endurance), Curl-Ups (Muscular Endurance), Push-Ups (Muscular Strength), and Sit and Reach (Flexibility). Do you know which assessment your student wishes to improve? 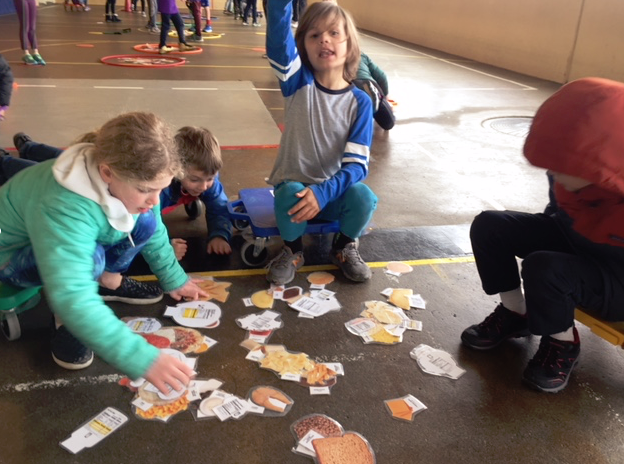 Students are encouraged to work on activities outside of PE that support their goal. Working together with friends and family makes everything more fun- not to mention, it cultivates the culture of wellness at home and develops positive exercise habits at a young age! Last chance to drop off candy! 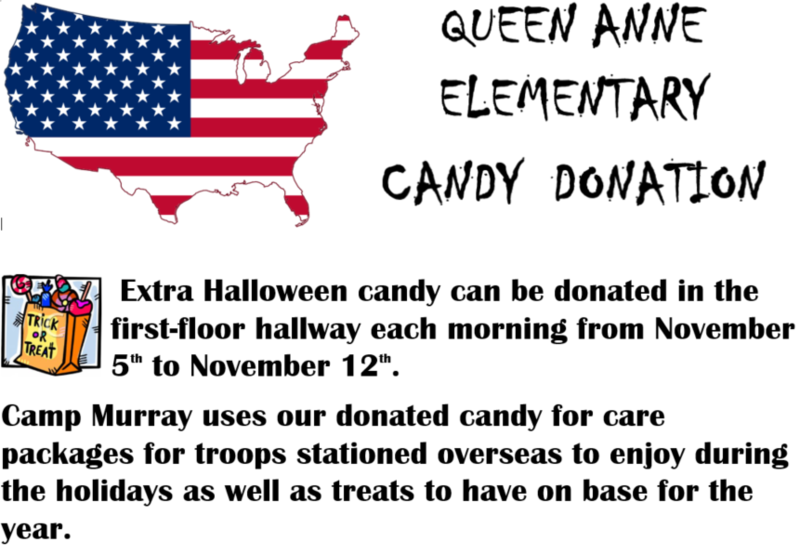 Candy will be picked up on Tuesday, 11/13. If you would like to donate any extra candy laying around, please send it to school to be dropped off before school starts on Tuesday. Candy will be picked up, along with the beautiful cards made in art, during the school day. Thank you for all of your donations so far! I hope your summer was as beautiful and relaxing as could be! 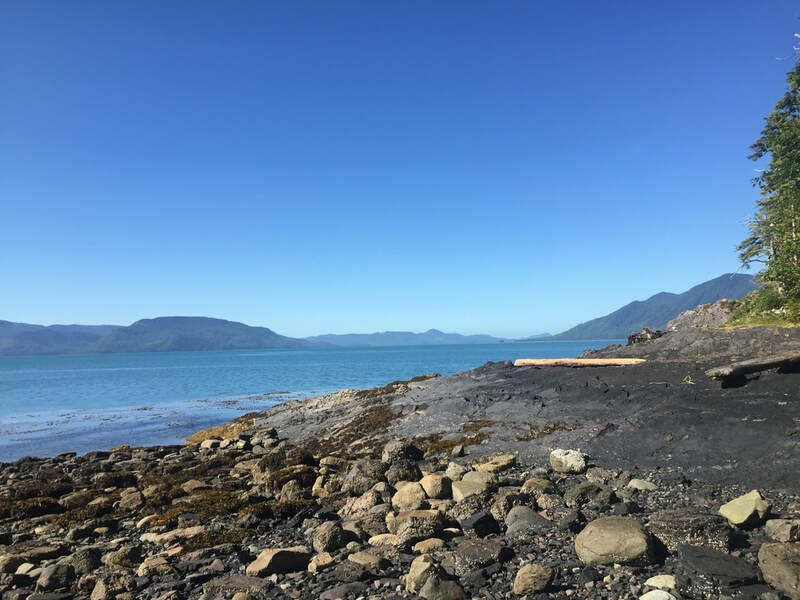 My summer was spent fishing in SE Alaska again, it was hotter than ever with the least amount of rain I've ever seen. We caught some salmon when we could, so you can purchase it from stores to maintain your brain health! :) I've always loved the way Alaska helps me to slow down and enjoy each moment- something I continually strive for when I return to the busy school year and loud city! It's hard to believe we're already in to October! Have you been by to check out our REAL gym?! What a difference this space makes for our ability to focus and learn in PE. September was full of practicing routines and learning how to best use the space- from entering and exiting to our Peace Place location- we have the routines we need to be successful down now. With our new gym, we need to ensure students are wearing appropriate athletic style shoes for PE. The floor is now wood (wahoo, no more cement!) and we need to do everything we can to help preserve the floor. Hard soled shoes increase wear on the floor. This will be great practice for when we have a brand new gym next year! Wearing athletic shoes also increases your students ability to move around in PE, without having to worry about shoes falling off or slipping. Safety! Hard soled and/or heeled shoes aren't as stable while we're moving and grooving in PE, increasing the likelihood of injuries. I have a small selection of shoes students can borrow, though I'm still working to collect appropriate sizes for all grade levels. If you have any old, but usable, shoes in size 3, 4, or 5 that you'd like to donate...please let me know! In October, we'll continue with cooperative games to build on our fitness skills and fundamental movement skills (kick, throw, catch, jump, etc. ), in addition to affective skills. Grades 3-5 will begin fitness assessment next week to set a baseline in order for us to practice setting goals and work toward those goals throughout the school year. 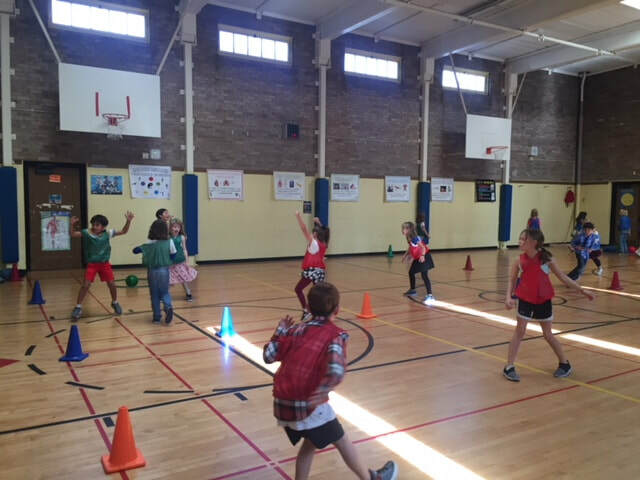 K-2 PE students will continue with skill building through games and activities- moving in open space safely, working together with classmates, and doing what is expected in PE. Stay tuned for more updates and our new PE schedule posted! Bike to School Month and Bike to School Day...it's all in May! Bike to School Month is May! How many days out of this month are you able to change your transportation to biking? On May 9th, Wednesday, it is Bike to School Day! If there is just one day you'd like to try, this would be the day! District-wide, students are participating in this challenge. Remember, it is unlawful to ride a bike without your helmet! Though you may be confident in your riding ability, it is your responsibility to protect your brain from other unexpected accidents! Use this fitting guide to help you. All students grades 3-5 this school year had an opportunity to practice bike safety and bike skills. 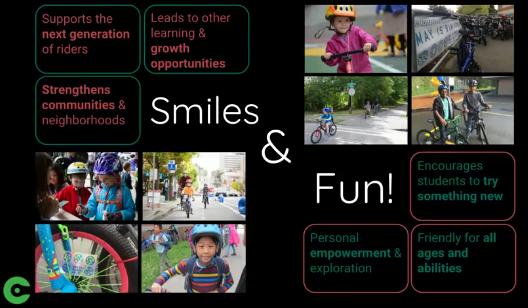 We used the bikes and helmets from Cascade Bicycle Clubs "Let's Go" rolling unit in October 2017. Looking for a fun and challenging way to promote fitness at home? 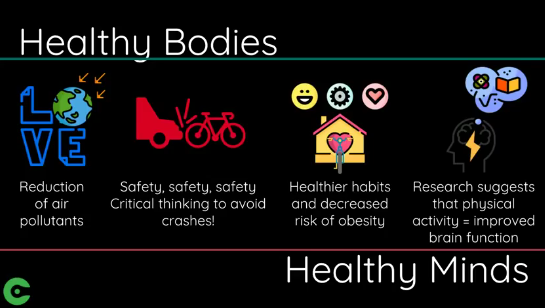 Studies show that when we model healthy living habits to children, they are more likely to try it out as well. In the "Documents in Videos" section of this website I added an April Fitness Challenge for your enjoyment! This one is baseball themed as we enter baseball season. Print it out, or let me know if you'd like a copy, post it in a common space and see if you can make it through each days quick challenge! March is National Nutrition Month and we're celebrating by learning how to make informed food choices and physical activity decisions. 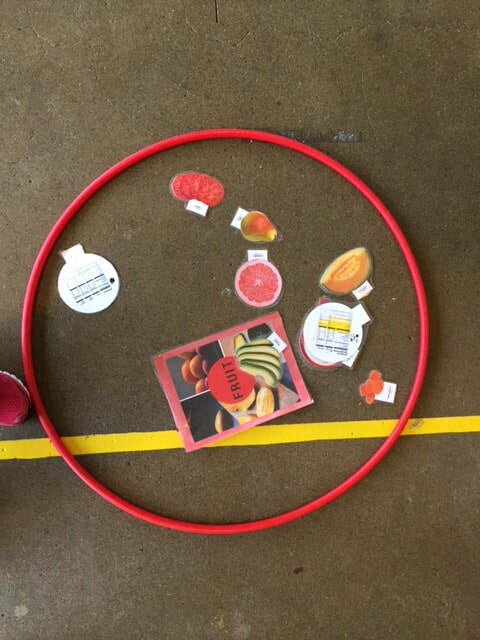 All grades have learned or reviewed the food groups and sorted foods in to these groups. 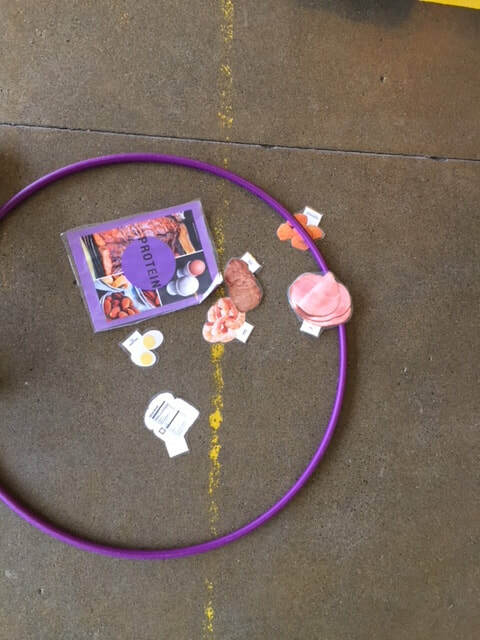 We've learned that every food has energy for my body to use (measured by calories), though some foods like "sometimes foods" (sugary, greasy, salty, processed) provide energy with minimal essential nutrients. Eating foods produced in nature provide more essential nutrients to help us learn, grow, and play. Discussing essential nutrients, their purpose, and the food groups that provide high amounts of each has been a blast! Through skill based games, we've been able to explore the many ways we can provide nutrient dense food choices to fuel our play and help our brain focus! In Nascar Nutrition, we learned that food fuels our body. In order to continue fueling our "race car", scooter, each lap around the track required students to stop at the "pit stop" to re-fuel. Scooters matched the food groups, so a blue scooter meant that the student would find a dairy food. While one partner practiced pulling and pushing on the scooter, the other worked with stretch bands- helping us to learn the muscles in our body. Which two food groups are we missing? 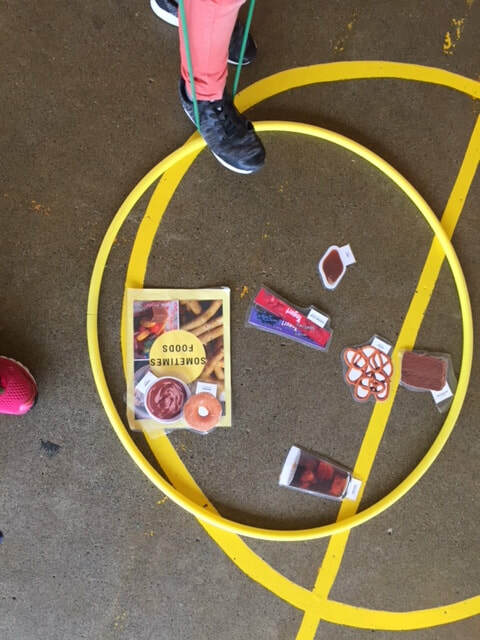 Do you see any foods that need to be in a different hoop? One major focus in PE is working together with all of our classmates. Through problem solving teamwork games we learn to take turns, create solutions, and communicate effectively. In the VIDEOS tab of my site, 3 new videos from today's lesson are posted! They are just a glimpse of what we do in PE, but worth the watch! PE is in the play court, where there is not climate control. Please help by sending your student to school ready to play outside! We stay dry, but sometimes it can be chilly in there. Rain boots are fabulous for recess, but on PE days they contribute to trips and safety issues during class. Be aware that athletic style shoes help your student to stay safe in PE. Did you know that 5th graders get a FREE season pass at Stevens Pass? Skiing and snowboarding are great activities to improve awareness (both the relation of their body to the space they're in and self-awareness, strengths and areas to improve), muscular endurance (mostly core and legs), whole-body coordination, balance, self-confidence, social skills, and perseverance. Outdoor activities are also proven to increase mood and provide experiences to appreciate nature. I am thrilled to be a part of the QAE community and look forward to a fantastic year in PE!